Click To EnlargeHey everyone, I would just like to take a minute and let everyone catch up on what I have been up to getting ready for the 2011 season. I have been mainly training down in Florida through January and February with Russell Bobbitt and Paddy Holloway. We have been training all over Florida in places such as Croom, Pax Trax Mx and Bostwick, just to name a few. I raced the first National Harescramble in Perry, GA on February 13 to try to get some racing in before the season kicks off. I got a good start and rode with Bobbitt the first lap and a half or so. At the end of the second lap I had to stop for gas and Mullins, Whibley, and Lafferty got around me. The next couple laps I raced with Cory Buttrick, which was good for me to gage my speed off of him. He gapped me a bit with two laps to go, but on the last lap I caught back up because he was having some bike troubles. I ended up finishing right behind him in 7th place, so I was happy. 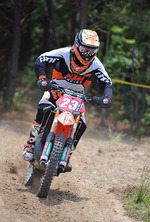 This past weekend I raced the Cherokee Enduro in GA, were I battled with Cory Buttrick and Steward Baylor the whole day. Baylor won the 1st test, I won the 2nd, Cory won the 3rd, I won the 4th and 5th, and Cory won the last test. It was a close race, with me beating Cory by 17 seconds and taking the Overall win. The great track and great weather conditions made for a really fun day of racing. With those two races under my belt I am excited to race the first National Enduro this weekend in South Carolina. I look forward to seeing all of you guys at the race this weekend!